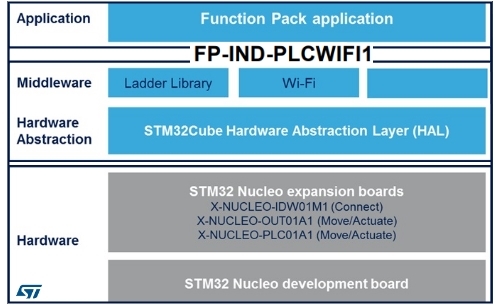 FP-IND-PLCWIFI1 is an STM32 ODE function pack which lets you build a mini PLC and interact with it using the ST-PLC App for mobile devices or desktops. Thanks to the provided APIs and the app available for different operating systems, the package allows managing the system and implementing several ladder logic circuits with different hardware setup. The software runs on the STM32 microcontroller and includes drivers for the SPWF01SA Wi-Fi module, the VNI8200XP and ISO8200BQ digital output ICs, and the CTL01-38SQ7 digital input IC. 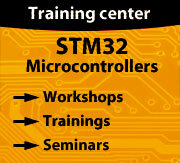 It also includes middleware layers for Wi-Fi communication and ladder logic programming.